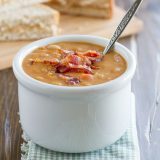 Skip the can – this Homemade Bean and Bacon Soup is hearty and filling and filled with veggies and chunks of bacon! Growing up, Sundays were always the same. If we had morning church, we would come home from church, and lunch would be soup and sandwiches. I don’t remember ever having anything but soup and sandwiches for lunch on Sundays. One of my favorites on those Sunday afternoons was the bean with bacon soup. I don’t know why I loved it so much, but I would always choose it over the chicken noodle or split pea with ham. Well, my daughter has this love of soup. She would probably eat homemade soup every day if I made it for her, but since that’s just not possible 🙂 we always have a few cans of chicken noodle soup on hand. That girl can eat an entire can of soup for lunch herself. One day, at the grocery store, I was letting her choose out a few cans of soup. And there I saw it – the Bean with Bacon soup. I decided to buy a can to have on hand for if I ever wanted to eat it for lunch. Fast forward a few weeks, and my daughter gets home from school, asking for soup for lunch. I go to the pantry, and not a can of her beloved chicken noodle soup left. She sees my can of Bean and Bacon soup, and asks for it. I begrudgingly say yes. And then she only eats like 2 bites of the soup. After she left the table, I decide to eat a bowl of it for lunch since it was already open and out. And I ate about 2 bites of it and was done. I don’t know if my tastebuds have just grown up, or what, but I did not like it. It tasted overwhelmingly of smoke, and not like real smoke. Like liquid smoke. I was sad, but only for a minute. Because right then, I decided that I needed to make a homemade bean and bacon soup – with flavor from real smoked bacon. One eye opener for me when I visited the Culinary Institute of America with Jones Dairy Farm last year was that a lot of companies use liquid smoke to flavor their meats and bacon. I felt duped. When something says smoked, I’m thinking it’s actually spent some time in a smoker, but that isn’t always the case. For my soup, I knew I wanted actual smoked bacon, not liquid smoke or bacon that had been flavored with liquid smoke. So naturally, I chose my favorite Jones Dairy Farm bacon – their Dry Aged Cherrywood Smoked Bacon. I’ve said it here a thousand times before, but no other bacon compares to this bacon in my eyes. After choosing the perfect bacon, the rest was pretty easy. Some beans, veggies and chicken broth are cooked together. Half of the mixture is pureed to give you that thick, creamy texture. Add in some tomato sauce and stir in the bacon – it’s the soup that blows that soup of my childhood out of the water. Seriously – this bean and bacon soup was so good – there will be no more cans of soup in my future! WATCH HOW TO MAKE THIS HOMEMADE BEAN AND BACON SOUP BELOW! Cook the bacon in a soup pot or Dutch oven until crisp. Remove with a slotted spoon to a paper towel lined plate. Discard all but about 2 tablespoons of the bacon grease. 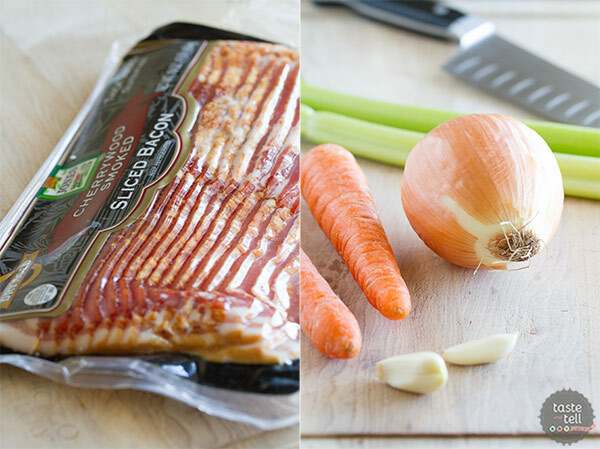 To the hot bacon grease, add the onions, carrots and celery. Cook over medium heat until they start to soften, about 5 minutes. Add the garlic and cook an additional minute. Stir in the chicken broth and beans. Season to taste with salt and pepper. Bring to a bubble then reduce the heat to low and let the soup simmer for 1 hour. Remove half of the soup to a blender or food processor. Process until smooth. Return the puree to the soup pot and stir into the remaining soup. Add the tomato sauce and 3/4 of the reserved bacon and stir to combine. Taste and season to taste with salt and pepper. Let the soup simmer until it is heated through, about 5 minutes. Serve topped with the remaining bacon. I’m with your daughter Deborah, I’d eat homemade soup every day (if you made it for me!). I used to eat Bean and Bacon Soup from a can and candidly it is not a soup that has crossed my mind to make from scratch. Like most recipes I’m sure it’s better and soul-warming. Thanks for forging ahead so I now can make it! Love bean with bacon, canned is too exspensive & yuk is right love home made!!! I just made this recipe in my electric pressure cooker. I doubled the recipe for our big family and it fit in my 6 qt pot. I browned the bacon in the pressure cooker and then followed the instructions as given. I added 1 pound of dry great northern beans and 2 cups of dry white beans and 8 cups of liquid (remember I doubled the recipe). I did add some of the bacon to cook with the beans. I then used my bean setting for 1 hour and the beans were done just right (which for me is very soft). I blended and added bacon and tomato sauce according to the recipe. It was amazing! 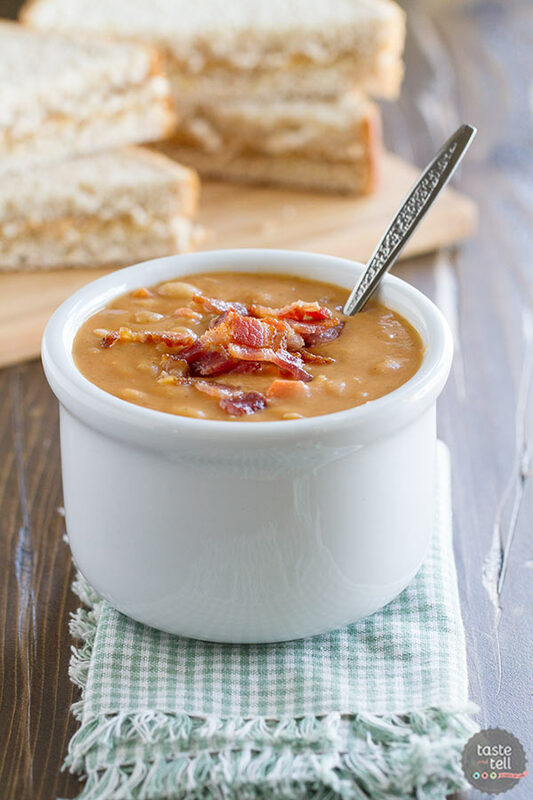 Bean with bacon is one of my favorite soups and this recipe is so tasty! My very favorite soup. Thanks so much. 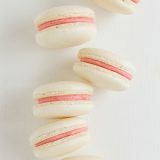 mmmm this looks so creamy and delicious! I’m a huge fan of soup but I don’t think I’ve ever dunked a pb sandwich into it! 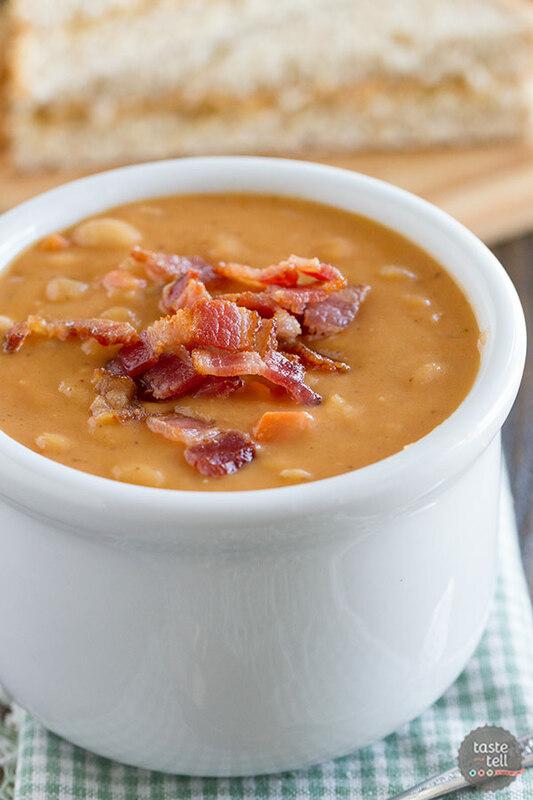 LOVE Bean with Bacon Soup – I can not wait to try this homemade version. I can only imagine how great it will taste! This looked so yummy I made it today :). So easy and a big hit! I didn’t realize until it came time for the tomato sauce that I was out. Ugh. So I thinned out paste and used it instead. Thanks for the great recipe! Gak—soup in a can. Gak again. Man once you eat homemade soup, you can’t go back to soup in a can. Homemade bean and bacon—Wowzer. I love that bean soup. I should capitalize love in that prior sentence. I am delighted your daughter has discriminating taste buds. I bet you were/are part of that process—-ya think. This looks soooo yummy, and I love the short ingredient list! This bean and bacon soup just looks so comforting and hearty. Thanks for the delicious recipe! I love homemade soups. Thanks for this one, I haven’t even thought of Bean n Bacon soup in years. My love of soup comes from my dad – he was always making soup, and I think of him every week when I make a batch of soup. Yes, I put the pot on the stove early on Saturday or Sunday mornings, and clean out my refrigerator of all vegetables, chop and dump them in the pot with some appropriately flavored broth and meat…yum! Soups can be frozen in individual portions for several months, so each time I reserve 2-3 servings and freeze the rest. That way I don’t have to eat the same one until it’s gone. My favorites are Beef Barley (Dad’s recipe) and Oxtail soup (my Polish Grandma’s recipe) and Cilantro lime chicken. Also, whenever I make meat of any kind (baked, boiled, fried, it doesn’t matter) I reserve the juices and freeze them for broth. After dinner the veggies get frozen for my next batch of soup. When chopping veggies for meals, the celery tops, cilantro stems, green onion tops, 1/2 a jalapeno, whatever does not fit the recipe go into the baggie of veggies to the freezer for my next batch of soup. Have all the leftover juice in the bottom of a bowl of pico de gallo? Freeze it for broth! Boil or steam veggies? Freeze the water for broth! As you can probably tell, next to nothing goes down my garbage disposal, and anything not edible goes back to the garden for mulch. And I have homemade soup available any time of the day for a meal or snack. I think I need to try your peanut butter sandwich dunked in my soup for lunch today! Yummy idea! I agree! Great ideas! Thank you, Maureen! I used to keep soup jars in my freezer. Leftover broth, gravy, veggies and meat would go in the jar. I kept one for chicken and one for beef. I would thaw the jars and add whatever else I needed to make a great pot of soup! Oh, I love this! I can’t wait to make this! I am so glad to hear I am not the only one! The canned Bean w/Bacon soup was always my favorite, but the last few times I’ve tried it, it was NOT good! I can’t wait to try your recipe. Thank you! I’m an Australian living in Sydney and we’re in our summer right now, but can’t wait until our winter to try this. My only questions though is – what can I use in place of the SMOKED bacon as we only have regular cured bacon. I have travelled throughout the States extensively and found that your supermarkets have an immensely larger range of food-stuffs than we do. I have found a warehouse here that imports a very few of your products including a little bottle of liquid smoke which we can’t buy here in our regular supermarkets. So, could I use a drop or two of that. I haven’t actually used it before as I’ve only just bought it in the past week. You could use the liquid smoke to give you the smoky flavor – just use a light hand because I often think the liquid smoke ends up tasting artificial. And really, if you aren’t accustomed to the smoky flavor of bacon like I am 🙂 you could probably use the regular cured bacon and be just fine! Josephine my Daughter lives in New Zealand. 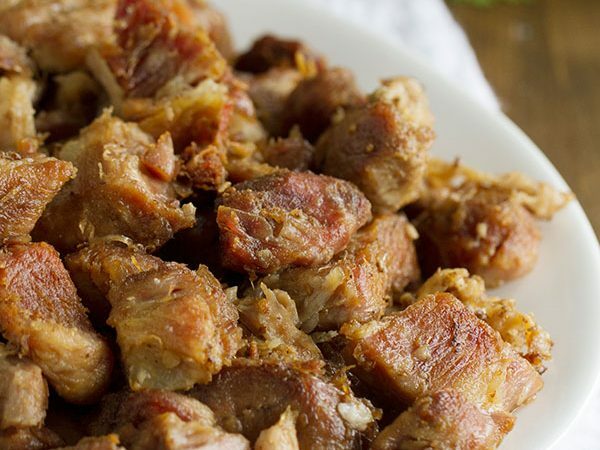 You can use streaky bacon, ham hocks or cubed ham. In Wellington there is a great butcher that is fantastic at helping this Yank find substuites for American cuts of meats when I visit. Good Luck. Instead of liquid smoke, if you have smoked paprika available where you are, it has an even more intense smoked flavor than the liquid smoke, but does not taste fake. I used to use liquid smoke all the time until I discovered smoked paprika. This is a fantastic idea. I love smoked paprika. 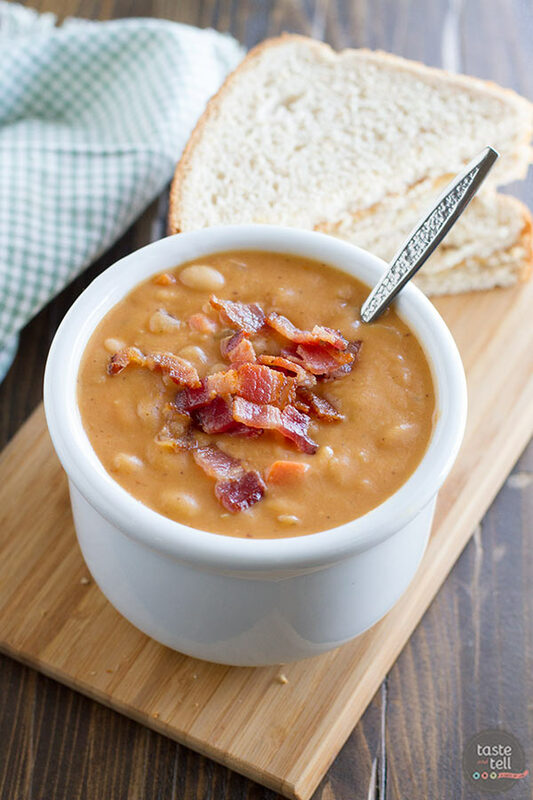 Will definitely try this recipe as bean with bacon soup is one of my all time favorites….even the canned variety occasionally (Though nothing goes directly from the can to my bowl with being “doctored” up a bit with some of my favorite seasonings. 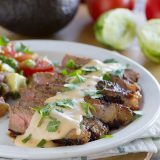 This recipe seems a bit lean on seasonings to me but I always make a new recipe as written the first time before deciding what if any additions to include in later versions. thanks for this!! I love bean and bacon soup (the canned variety). I made a big change and used dried beans, and halved the recipe (it’s just me eating this). It’s in the crockpot to simmer all day for dinner tonite! I cheated and tasted already, I won’t add the tomatoes until this evening (I had to use roasted I had in the freezer, no sauce). I love the idea of sticking it in the slow cooker!! I hope you loved it as much as we did! it was great in the crock pot – although due to a repairman here at dinnertime, it cooked a bit too long – but the soup is wonderful!! I told my friend in Dallas, she made it as well (her husband loves bean and bacon) – it was a hit with everyone! Using dried beans, should I soak beans before cooking in crockpot? Sounds delish! I don’t normally cook with dry beans, but I would probably soak the beans overnight before adding them to a slow cooker. I cook dried beans overnight, no soaking, in my crock pot. Make sure you have 4-5 inches of water above the beans, so that the water doesn’t cook out in the night. On low 12 hours. Perfect beans in the morning! Then you can use them for recipes like this or White Bean Chicken Chili! Made this tonight for the family, and it was delicious. I asked if it was a “make again” meal, and the family said yes. I would love to try it in the slow cooker, too. To address two questions I saw: 1) I cook beans in the slow cooker a lot, and I rinse them, but I don’t soak them first. 2) You could easily substitute any white beans available at your market. I never used to pre-soak dry beans until I learned that pre-soaking and rinsing eliminates the gas that beans can cause! Could you substitute the kind of beans? Yum can’t, wait to try but I’m also in Australia so will wait till winter. I have another ingredients question- the beans, what type are they rather than the brand that we can’t get. Cannellini beans? Also is a can of Tomato sauce, small can of tomato paste (concentrate) or ketchup type or prepared pasta sauce? So many questions! Thanks in anticipation. Hi Jilly – cannellini beans would work just fine. Any white bean will probably work. Tomato sauce is a simple sauce made of cooked tomatoes with usually just salt and minimal seasonings. If you use tomato paste, you’ll want to cut the amount way back to probably a tablespoon or two. I wouldn’t use ketchup, but prepared pasta sauce *might* work. I think your best bet would be to just use the paste. You’ll want to thin it out a bit with some of the liquid from the soup before stirring it in, though. Good luck! Hi Jill, passata would be the same as their tomato sauce. That is readily available in Australia. i make this often. But I always use smoked sausage, sliced. I will definitely try it with bacon!! Made this soup for dinner last night and I am happily eating the leftovers tonight. I, too, loved this as a child but, the taste of canned soup is “yewww” compared to home made. So happy to have seen this fabulous recipe. Thank you for posting. This was my favorite soup as a kid as well! I haven’t had it in literally decades, but now I need to revisit. I think I’ll skip the can, though, and go straight for this recipe. Homemade soup beats canned every time…. for convenience I always make a big batch & freeze single or family sized portions. The only ingredient you need to be careful of is celery as it can overpower when frozen. I just omit or use less if I plan to freeze. I also love homemade stock & concentrate prior to freezing…. extra tasty & always convenient! ! It might work – maybe try adding just half of it and tasting it to see if it needs more. You could also try a couple tablespoons of tomato paste – just make sure you thin it out a bit before you try to stir it in. I’ve substituted ketchup before, but just a few tablespoons. It tasted great! I just finished making the soup, so delicious! I’m hooked!! I made this tonight and it was sooooo good. Thanks! You are welcome – I’m happy you loved it! This is not a one hit wonder! The soup was a big hit! I made it this morning so that I could serve it for lunch with some heavenly homemade bread. My Husband loves bean & bacon soup, so needless to say when he realized what he was smelling he could barely contain his excitement! I doubled the amount of veggies, added an additional 15ozs of beans (I prefer not to use canned foods so I soaked the beans over night) & add a couple more pieces of bacon. 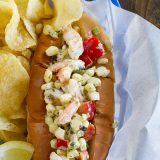 I will definitely be using this recipe again! I agree about the more veggies & beans. We like our soup with lots of the goodies. That is the only change I would make; the flavors are perfect. Can you use marinara sauce as the tomatoe sauce? I wasn’t sure what “tomatoe” sauce meant, so I figured regular, marinara pasta sauce would work. You should be able to find tomato sauce with the canned tomatoes in the grocery store. Marinara has extra seasonings and herbs added, while tomato sauce is just tomatoes. You could probably use marinara, but it would add in whatever extra flavorings your marinara has. I have only ever used canned tomato sauce for this recipe, but I’m sure that if you used a tomato puree that would work as well. Thank you from the bottom of my soup cravin belly! I used to love the ‘canned’ version of bean and bacon soup. My dad used to eat it a lot when I was a child, and of course I HAD to try every thing he did! I loved this soup and was my fav until a few years ago. I noticed that the soup had a very distinct smoky flavour to it. It was awful and I was heartbroken, why oh why did they change the recipe! Now, with great thanks to you and your daughter, I have once again fallen in love with Bean and Bacon soup! Seems like everyone loved bean with bacon soup as a child! I know I sure did. Well – I made Deborah’s version for dinner tonight and it was just terrific. The fresh veggies sauteed in the bacon drippings made the kitchen smell wonderful while it cooked. The only thing I did differently was that I didn’t put 1/2 the soup in a blender. I just took a masher and just mashed around the soup for a minute or two until it was the consistency I wanted and that was that. One less thing to clean! The soup was fabulous and I’ll never have anything but homemade bean and bacon soup ever again. Thanks so much for the recipe, Deborah! Thanks for this idea! I have my first attempt simmering on the stove now. Think I’ll try my immersion blender instead of dirtying up another big item. Smells wonderful while it’s cooking! Made this soup for dinner and it was outstanding. I used my dehydrated, carrot, onion, celery and garlic. Also my home canned beans and chicken broth. Only had to purchase the tomato sauce and bacon. I will definitely be making this again. I love down to earth recipes and this is the best I’ve seen in a long time. Just made it! It’s so delicious and perfect for this rainy day. Thank you! I made this for dinner last night. I made a couple of minor changes – I left more of the bacon grease in the pan when I cooked the veggies and I used a tablespoon of tomato paste instead of the tomato sauce. It was absolutely delicious! I made this for supper last night (it’s winter where I live) with a few substitutions for local products, absolutely delicious. Thank you. I added a bit of chopped up feta cheese when I served it – yummy! I’m intrigued by the addition of feta – I must try that next time!! Are you sure this only makes 4 servings? Cuz if so, CalorieCount.com says 1 serving is over 1400 calories! That cannot be right. 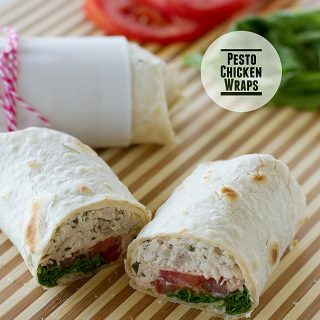 You could definitely stretch it out to 6 servings – these servings are pretty generous. The majority of the calories from the soup come from the beans (there are a lot of them in there!) and I definitely think calories from beans are different than eating a ton of calories from something less nutritious. But if you are looking at straight calories, then yes, this is definitely not a low-calorie food. Tony, make sure your CC analyzer is using canned beans and not dried — it makes a BIG difference. The recipe as written makes at least 13 cups of this delicious soup, so that would make each serving well over 3 cups. By my calculations one cup of soup has approx. 183 cal / 5.4 grams of fat. I used center cut bacon and low-sodium chicken broth and it was delish! Getting ready to make it for the second time. When I was growing up, bean and bacon soup was my favorite!! But then I had kids and found out how much better cooking from scratch was, both in taste and nutrients. This is one of my favorite soups!! Your mom was a smart woman for cooking light on Sundays. It’s so busy and I too cook simple meals on Sundays, so that I can focus more on the Lord and just resting during the day between services. I cannot wait to try this recipe! I can only find applewood smoked bacon – that would work, right? I made this soup tonight….it was absolutely unbelievable!!!! Like many, I grew up on the canned bean and bacon soup. This was just outstanding! The only changes I made were,to add more of the bacon fat and, add a good tablespoon of butter in the pot just before serving. I would make this time and time again. You can never go wrong with more bacon fat! I’m so glad you loved the recipe! I’ve tried other bean soup recipes with little success – flat tasting… I knew when I read this recipe it was THE one and I was right! I’ll be making this again and again in the coming fall and winter! How would you substitute dry navy beans for the canned ones? I haven’t made this with dry beans, so I’m not positive, but my best guess would be to cook the beans first and then add the specified amount to the recipe. I always use dried beans either great northern or navy beans. I also soak them first for several hours or overnight. Drain the soaking water, rinse and then follow the recipe. The only thing to watch is that as the beans cook that your liquid is not taken up by the cooking beans. I occsionally have to add a bit more chicken broth or water. The dried beans are the cheapest way to go. Someone else replied that they used a potato masher to mash up some of the beans and it worked well! OMG this was amazing! I made it exactly as the recipe said and it was fantastic everyone gobbled it up, I served it with a crusty baquette. Thanks for the recipe! I made this last night and it was so good. I did not change a thing and I will make it again. Thank you! Thanks for the recipe! I’ve made it twice and it’s been a hit with the whole family. I love that you listed cup measurements for the veggies, makes it more consistent with different sizes of veggies. Delicious! I have been craving bean with bacon soup for a while, so I made this yesterday. I used Trader Joe’s ends and pieces of uncured bacon and chopped up an end hunk of ham that I got for a buck from the odds and ends rack of the deli counter. I used dried navy beans — a whole pack — soaking them overnight (and rinsing before using! ).did use a little liquid smoke and it was fine. I had to add water to this recipe because of the dried beans. But the soup is delicious, even the first day! Didn’t realize so many people were bean and bacon soup lovers too. I used to eat the Campbell’s version in my younger years. Can’t wait to try this one. Just made this tonight and it was incredible. I doubled the bacon (cause I love me some bacon) and the cherry smoked makes it perfect. I’m sure it wouldn’t have had the same taste with Oscar Meyer. Thx for the great recipe. By the way after pinning over 1000 recipes this is the first one I’ve ever commented on. Thank you so much for this recipe! It was a hit. I did do a few modifications based on what I had and what my family likes. First of all, I had just finished making Split Pea Soup with a ham-hock. I took the bones from that ham-hock that were already used and put them in some water in my crockpot. I let them cook overnight then added the veggies. I only had one bag of white beans in my freezer (dried beans that I cooked and froze) but I started the soup anyway – in my crockpot! I knew I needed more beans so I bought 2 cans to add, but instead of adding them whole I put them through the food processor with some liquid from the soup. Now I had a great creamy soup with the veggies and some of the beans showing. I also had a few tomatoes left over from canning that were starting to go. I cut off the bad parts, peeled them and cut them up very small. I added them to the crockpot and let everything cook for another hour. Oh my gosh, what a great combination. Between the creamy beans, the cooked beans, the cooked veggies, the tomato sauce, the bacon and the extra tomatoes tossed in near the end, i was PERFECT. Definitely a WINNER! I love that you were able to make it work from what you had on hand. I’m so happy you loved it! Deborah, I had to come back and let you know how much I am enjoying this soup. So far I’ve made it tree times since Oct 1st. It’s my go-to now when I eat lunch at home. (almost every day) My second batch was in the fridge and my hubby wasn’t eating it so I put it in portion size freezer bags and froze it! Warmed in hot water, put it in a bowl and zapped 😉 for 1 min in the micro Delish! The third time I made it, I made a change. I had some vegetable soup that I had canned this summer but the pepper slipped in my hand and it had too much pepper. I figured I’d find a way to fix it later. I put a quart of that with a quart of ham-bone broth plus the beans, veggies and bacon in my crockpot and it came out WONDERFUL! Your recipe has inspired me to have bean soup with bacon almost daily, following the recipe pretty much but using what I have. Thank you! Yum! Yum! Yum! Oh btw, I’ve been slipping in two bay leaves for an extra layer of flavor. I’m so happy that you have enjoyed it so much! And I love how you have adapted it to make it work for you as well! Hi Deborah, I just had to come back one more time to tell you that your soup is still on my rotation of soups. We really do love it! Please explain how you got the soup into freezer bags without souping the kitchen! In addition, canned beans have too much sodium for me so I have to use dried beans. Steve, put a plastic bag into a container then use a wide mouth funnel (find one in canning dept. @ Walmart if you don’t have one) to pour the soup into the bags. Also, you can use dried beans. I do and it’s still delicious! Just estimate the right amount. A few more or a few less won’t make a huge difference in this soup. Your other option would be to cook the beans, then borrow a can from a friend. (or buy one regular size can of chopped tomatoes – I’ve seen them as low as 15 gr. of sodium.) Once the beans are cooked, measure them with the empty can. Keep that can by washing and drying it whenever you use it so you can measure things. Or just use a liquid measuring cup. I think most cans are 15 ounces and a liquid measuring cup is 16 oz. You can get it very close. Good luck and enjoy this wonderful soup! You should be able to find them at any grocery store, but any white bean should work. I just bought a can of it too and thought it tasted like a chemical, I used to love it. Thanks for the recipe. It just finished cooking and I devoured a bowl. It was fabulous. I tweaked it a bit by adding a 6 oz. ham steak chopped which I added in the beginning of the cooking. YUMMY! Sorry, I just realized this soup calls for canned beans. But you could soak dry bean, cook them, and use them and it may help. Making this a second time since the first time was outstanding. Family said first try was too thick. Still great though. Thanks for posting. this soup is perfect! I have never even had bean and bacon soup but needed to make something with the bacon in my fridge. I will be making this again it was absolutely to die for. followed the recipe exactly.Thank You!! made this and while it was really good, it was way too salty. Between the chicken stock, the tomato sauce and the bacon it was salt overkill. Good thing I didn’t add any salt because there is no way we could have even ate it. Will be making it again but will try and offset the salt somehow. I cannot wait to make this soup. An all time favorite as a kid, but do not like the canned soup anymore. I think your recipe will hit the spot for me and family. I made this last night (exactly as written) and my husband and I both thought it was delicious! Bean with bacon was always my favorite growing up but, like a lot of you, my taste buds changed over the years. Now I can enjoy my old favorite, in a new and much better way, again! Thank you for sharing. We had this for dinner tonight. I made it just as written (a rarity for me), and it was delicious! My husband made sure there was enough left over for him to take to work for lunch tomorrow. Thank you! I’ve made this recipe twice in the past two weeks. The first time it was great but way too salty. My own fault for doubling the bacon (love bacon) and using regular chicken broth. Today I made it again with the 8 oz. of bacon the recipe called for and low sodium chicken broth. It was perfect! Beyond great! Thank you so much for your recipe. Canned bean and bacon soup was a favorite of mine growing up, but when I got older the canned taste bothered me. Now I’m just thrilled I get to eat it again. I’m so glad it was a success!! This soup is delicious with so much flavor! I did add extra broth the next day because it was too thick. I will make this again. 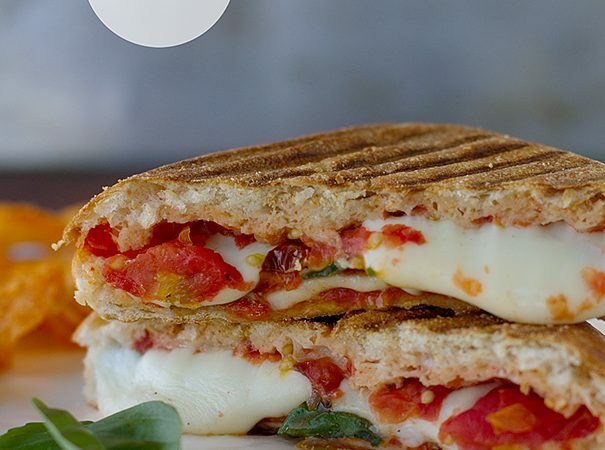 You nailed it with this recipe! I made it tonight and it reminded me of the Campbell’s bean & bacon soup of my youth…..only soooo much better and fresher!! It’s staying in my soup file! Yay – glad you loved it!! This soup is hearty and tasty. I used diced pancetta instead of smoked bacon. Unfortunately my stomach blew up like a balloon, I guess the great northern beans were too much for my system. I might try a different bean next time. You could try soaking the beans first. That reduces phytic acid which many people find helps with the bloating. would like to try this soup, but my son can’t have the chicken broth. Can I use veg both instead? Or would it alter the taste to much? I’m sure vegetable broth would be totally fine! Made this soup today for lunch and it is FABULOUS!! Didn’t change a thing and thought it perfect. It was easy to make and delicious. Thank you so much for sharing and posting the recipe. Somethings a bit bland about this. Any seasoning Recs? I would probably just add a bit more salt or pepper. Made this today, and it is awesome! I did make a change though. Rather than putting half in the blender to thicken it, I added about 3 or 4 cups of mashed potatoes. I’ll be making this again! Love the addition of mashed potatoes! I made this recipe tonight and it was delicious. This is going to be a staple in my recipersonal collection. I made this tonight, followed the recipe exactly, and my family loved it. Thank you for the keeper recipe! I’m so glad it was a keeper for you! This is a super recipe, and I think it has everything I like about the Campbell’s version and yet it’s much healthie! I decided to give it every advantage possible and boiled some smoked pork neckbones for a couple of hours the day before. The broth provided a flavorful finished product. I pureed more than half of the soup, which was about the only thing that caused this dish to differ at all significantly from my ail time favorite comfort food. I won’t do that next time. Thanks for the precise and thoroughly delicious recipe! I have always loved soup. As a child I ate LOTS of the canned soup from the brand I’m sure you are referencing. Now that I’m an adult my husband and I make all of our soup homemade. This caught my eye because bean and bacon soup HAD been one of my faves from this particular brand as a child…..Until I bought it a while back. Same thing, SUPER fake and smokey. Couldn’t eat it. Your taste buds did not change. This said brand CHANGED the recipe. You can look on the back of the can and see the smoke additive in the the ingredients..Nasty. So! I will be making your homemade version to add to my soup repertoire. Thank you for helping save a memorable flavor of my childhood this company ruined. It’s not your tastebuds. I ,too, loved this soup when I was young. Tried it a few weeks ago, and had only a few spoonfuls…They definitely changed their recipe/ingredients. Oh my god. I am going to make this soup! Never in a thousand years would have thought about making homemade bean and bacon soup. Like a lot of your readers, it was a favourite when I was a child. Hubby has never had it canned or otherwise and he’s going to love it. Thank you so much! I had thought of using my slow cooker to make this. How long would it take to cook using the canned beans vs. dry beans? I haven’t tried it with dry beans, so I’m not sure. Sorry! How much bacon do you put in the soup initially. You state use 3/4 if reserved bacon but never say how much to reserved. The reserved bacon just means the bacon that you cooked at the beginning of the recipe. You can add it all back in if you don’t want extra bacon on the top. Just wanted to let you know that I just finished making the 2nd batch of this soup in a week. It is super delicious! I did a couple of steps a little different. First I fried the bacon in a fry pan and then sauteed the veggies in that pan. Only did it way because it seemed easier than frying the bacon in the bottom of my dutch oven. Secondly I used a seasoning called Badia complete seasoning instead of salt and pepper. Badia seasoning is very popular here in Florida and we use it in soups and on veggies etc. The third thing was the brand of bacon. We don’t have the specific brand you used so I had to use another companies brand of cherrywood smoked bacon. I also added 8 oz of cherrywood smoked ham this time around. I just want to say again how delicious this soup is. We love to have fresh Italian bread with butter along with the soup. I feel the same wY you do. I used to love Campbell’s Bean with Bacon soup but in the last few years it just tastes yuck! I think they may have changed and ‘improved’ the recipe like so many other companies have. I can’t wait to try your recipe. I miss my B&B soup! Made this today and it was proclaimed a keeper. I had to use navy beans because I could not find Great Northern Beans in Canada. I was just wondering though is that 8oz bacon cooked or is the weight done before it cooking because it makes a massive difference. I bulk cook bacon chunks so just weighed out 8 ounces in cooked. I’ll probably still stick with this but was just curious. Also I added 1 cup of bone broth from a ham we had over Easter and I think it put it over the top. Additionally forgot to add that I used 2 1/4c. dry beans soaked over night for this. this soup was delicious! I followed as recipie read with the expection of blended most of the beans and I blended the bacon with it. definently a keeper! First of all, I really enjoyed this recipe. In the future, I’d blend in batches (I just dumped 3/4ths in a blender and let her rip) so I can better control the consistency… That is my preference and in no way reflects on the recipe. When I repeat this recipe, I will try omitting the tomato sauce. I thought the soup tasted great without it and was slightly disappointed with the flavor change after I added it. Removing my own individual preferences, this was an excellent soup packed with flavors (and nutrients!). Thanks! One of my new favorite recipes—- and I really LOVE good homemade soupl. I made it at least 3x this winter. Freezes well ( I like to freeze in individual portions in balls jars). 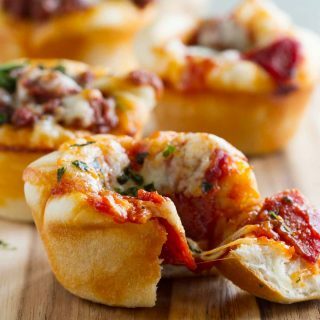 Fantastic flavor and easy to make. (the only thing I changed was adding just a little more bacon..-about 3/4 pound). Very hearty soup. Just a small portion and crusty bread is a very satisfying meal. I too loved the canned b&b soup. Then they changed it and ruined it! I have tried a couple of other recipes with no luck. This recipe is the best! I canned It for winter but I’m not sure It will last that long! Let me begin by saying I love beans…beans and rice, peas and rice, and bean soup of every variety. I too was a huge fan of bean and bacon soup in my youth so when I found your recipe I couldn’t wait to try it. I never write a review until I have actually made a recipe…who cares if I think it looks good…taste is what matters! Well I made this tonight and it was absolutely phenomenal! I added a few bay leaves and some red crushed pepper during the one hour cooking phase and it was absolutely delicious! 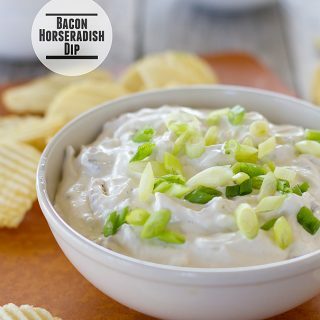 Than you for sharing this recipe….I’ll never buy the canned stuff again! I love your changes – I’ll definitely be trying some crushed red pepper next time! My Mom used to make a huge pot of potato soup (nothing like my Loaded Baked Potato Soup ♥) that almost constituted prison food I saw in old movies as a kid Ü. The only saving grace for that meal was the peanut butter sandwiches we would dunk into the drab potato soup. I need to ask her if she still makes that…ACK!! Bean with Bacon soup? Love, love LOVED it growing up. Haven’t even thought about it in years so guess what’s on my grocery list for tomorrow….3 cans of Great Northern Beans and smoked bacon! I can hardly wait for tomorrow’s dinner, thanks to you! Cheers! I use smoked ham hocks instead of bacon. I substituted Pancetta for the bacon. My husband said this is the best soup he has ever eaten. I made this soup recipe today and it was excellent. I rinsed my canned northern beans before use, mashed half the soup with a potato masher, and threw in a handful of diced ham. My only regret was there was no one to share it with. Thanks for sharing the recipe. Delicious! This was one of my favourites too and I agree the canned kind is not as good as it used to be. This is awesome! Whole family loved it! Made this today, served with homemade bread,, my husband said “you could charge $$$ for this”. I guess it’s a keeper! Ha! So glad he loved it! Ive been making this soup for the past 2 years and must say it is definitely one of my favs!! I boiled up some ditalini (small tubular macaroni) and a little bit of grated cheese which completed the soup! Its is a deliciously hearty comforting soup which I will be making for years to come! Love the addition of the ditalini! omg this is phenomenal! we’ve always loved the canned stuff until lately for so many reasons. this looks simple and similar to the canned version, but holy cow, it is so much better than the canned stuff ever dreamed of being! we ate the whole thing, so i will be doubling next time. I’m making this for dinner tonight! I’ve made LOTS of bean soup, but this recipe looks simpler than how I usually make it. I still love Campbell’s bean with bacon, but it has gotten to be pretty expensive, to get enough for all my kids and grandkids. If you use dried beans, rather than canned, it’s VERY economical. Another thing that brings the price down is if you can find bacon ends and pieces, rather than the sliced bacon. I actually grew up with Bean and Bacon soup, and I still love it and keep it on hand. But I just don’t eat a lot of soup. So I was hoping to find some heartier (and healthier) homemade soups to try out. Can’t wait to try this one! Although, I do have to say, for the record, liquid smoke IS real smoke. Though using too much can be fake tasting. I think it was Guy Fieri who explained the process and how they capture condensation from the smoking process. Anyway… Can’t wait to try this AND make bacon! 😀 Thanks! This is amazing! I used regular bacon and about 1 tsp of smoked paprika, as mentioned by another reviewer. otherwise followed instructions exactly. Will definitely be recommending and making again! Thank you so much for posting. Trying this out for the first time, my only question is when simmering covered or uncovered? Ok So I went with Uncovered and that seemed to be fine, I tasted it just before and also after the blender and all I was getting was celery and onion flavors pretty prominently. So I decided to improv a bit and I added some fennel and sage which I think really turned out nice. Perhaps if I had smoked bacon that would be different but with the regular old bacon I used this worked out pretty well. Just thought I’d share. Thanks for the recipe! This is my first comment on a recipe! The soup was so delicious, my husband and two daughters loved it! I just got an immersion blender, so easily blended it to our liking while in the soup pot. I can’t wait to make it again, and others on your blog! Blessings to you and your family! Food brings us all to the table, and what a good week for me to find your blog! Should this soup be simmered covered or uncovered? I’m not sure if we’re supposed to concentrate the flavors by simmering uncovered, or keep it from getting too thick by simmering covered. Someone else (Justin) posted the same question a couple of weeks ago and followed up with what he did, but we haven’t heard from Deborah yet. No worries — we’re all busy now getting ready for the holidays. Maybe I’ll try making this after the new year. Here in the SF Bay Area we don’t really do winter, so I can make this anytime. And many, many thanks for working out this recipe and posting it. Bean with bacon was my favorite soup as a kid and I’m really looking forward to trying a homemade version! I simmer it uncovered. I hope you love it!! 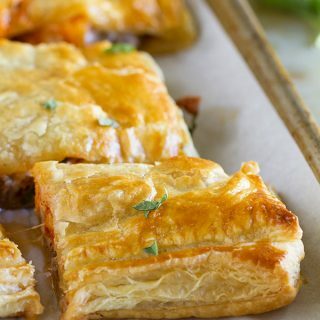 I just tried this recipe and it turned out great! I added about 1/2 c of very small-diced potato, otherwise I followed your recipe. Thanks for creating this keeper-recipe! I just made this for dinner tonight, and it was so good! I used low salt everything- even the bacon- and it tasted great! I didn’t want to bother having to clean a blender or food processor, so I just used my potato masher, and the consistency was fine. A little chunky overall, but it worked for me. Wow, wow, wow. This soup is perfection. I made it exactly as written and got nothing but rave reviews. I’ll be making this next week for our annual family Souptacular, and I know there won’t be a drop left in the pot. I made this soup in October and it was fantastic! I used a whole bag of navy beans as I couldn’t find canned navy beans. Added an extra 8 cups of water to the crock pot, and let it cook overnight. Turned out more like the best baked beans I’ve ever made! Didn’t bother to puree any, as we were starving! Will defunately make this again, but will use less dried beans or cook them ahead of time. Thank you for a fabulous tecipe! Bean and bacon soup has always been my go to comfort food when I am sick. I am so glad you posted this. The canned stuff just doesn’t taste like it did when I was a kid. Made this yesterday and it is wonderful! Used a natural uncared bacon with no artificial ingredients, glad they make this now. Hoping the soup freezes well. I made this with Kroger brand bacon. So good! Even my hubby had seconds (and thirds) — and he doesn’t even like beans! Thanks so much. This soup is fabulous,I made it two nights ago & having it for the second time now!! I will never buy canned again! NEVER!! Thank you so much!! Just made this for dinner tonight. So, so good!! This will definitely be going into the rotation. I do plan to experiment and see if I can make it with smoked paprika instead of bacon (trying to be healthier). where do you get your bacon at? I can’t find it. Sometimes i find the canned beans too sweet and isn’t right for me, so homemade baked beans is the best choice to taste the delicious flavor of baked beans. I made this for dinner tonight and it was wonderful! I followed the recipe exactly. Will definitely make it again. I just found this recipe and fully intend on making it. But! First can I just say THANK YOU! Thank you for posting your beautiful bowl of soup with a little (what looks like) peanut butter sandwich lovingly beside it. Whenever I tell of growing up and my mom would make me a bowl of chicken noodle soup and a peanut butter sammy to go with it, people look at me like we are completely batty! There was only one problem with the recipe. There weren’t any leftovers! We need to double the recipe next time. Yay! I’m so glad that this was a hit! This, my new friend, is the bean with bacon soup recipe I’ve been looking for. I made it with a pound of canellini beans (soaked overnight) in a slow cooker and It. Was. Marvellous. Like so many others, I’m adding this to our rotation. Many thanks for a delightful recipe! This was too my very favorite soup as a kid! I bought a can once about 15 years ago but it didn’t taste as good as I had remembered either. I made this for my family of 6 tonight & it was so delicious! They loved it too! I doubled it & added extra minced garlic & a splash or two of liquid smoke…only bc I had some in the fridge. I think just the small amount of smokiness made it even better. Next time I’ll add some smoked paprika instead. Thanks for a great Winter recipe!! I love the idea of adding smoked paprika! I’d give this 6 stars if I could! Absolutely wonderful! I made it exactly as the recipe calls for, and wouldn’t change a thing. Thank you for posting! This recipe is super amazing! I made it exactly as directed and it was almost perfect. I’m pretty used to the Cambles brand Bean with bacon which I know contains the concentrate, MSG, which I don’t like the idea of, but I like the savoryness it adds. So after I made the recipe as directed and sampled it as is I decided to add a teaspoon of soy sauce to the pot to add that umami taste that I tend to associate with the canned version. Since it’s only a teaspoon you don’t actually taste the soy flavor, but the richness it adds is very nice. Oh I also took the time to gently brown the vegetables in the bacon fat to make sure I got the most flavor out of them. Took an extra 10 minutes on medium low, but that’s okay. I also served this with sliced swirled rye bread on the side and a nice sprinkling of smoked paprika on top of the soup so the smoke scent hits your nose. 🙂 Over all this is a super recipe as is and doesn’t actually need any messing with. Any changes I made were purely for my personal tastes. Thank you for sharing the recipe with us. How many dry beans should I cook to equal 3 cans? You will need about 5 1/4 cups of cooked beans. I made this today and it was absolutely delicious. My only regret is that I didn’t double the recipe in order to have some on hand in the freezer. Like a lot of cooks, I sometimes tinker with a recipe a bit. The only adjustment to this recipe I made was to put three cloves of garlic through my garlic press, which I added after I added the chicken broth. Otherwise, I followed it as written. It’s flavorful, hearty and a true “keeper” that I will make again. I’m so glad to hear that it works well in the Instant Pot! I can’t see the recipe on your site! Maybe its broken?